--It's Dec. 31, 2013, and you look back over the past year. What's your biggest accomplishment? --What new creative activities do you hope to try during 2013? --What creative activities do you miss? Choose one that you miss the most or one that's easiest for you to do in your current life. How could you do this activity quarterly during 2013? --It's Dec. 31, 2018. What's your biggest accomplishment since 2012? What's your biggest surprise? --What small steps can you take that will shift your trajectory towards your goals? --What are habits that you need to work on changing so that you're not undercutting your efforts? --If you could only accomplish one big creative project before you die, what would you want it to be? Would it be a collection of poems? A novel? Some sort of multimedia project? Three weeks ago, I'd have been finishing my essay that explores women poets who use Greek mythology to explore the workplace, primarily workplaces outside the home. It was an interesting experience, and before too much more time slips away, I thought it might be useful to talk about what I learned in doing it. I've said that the idea for this essay came about in an ideal way. I went to a conference to present a paper on female poets and the use of both mythology and fairy tales. During the question and answer session, I remember saying that I observed that female poets tend to use mythology to talk about work and fairy tales to talk about home. So when I saw the call for essays for a collection on women poets and mythology, I thought back to my comment and wrote up a proposal. I still think that women poets use fairy tales to talk about home life. I didn't discover as many female poets using Greek myth to explore the workplace as I thought I remembered. Luckily, I am one of those poets who uses Greek myth in just that way--and my proposal was clear that I would be using myself as a case study. So that was fortunate. I did write to a wide variety of poets, just in case they had any obscurely published/unpublished work that I wouldn't know about. Most of them did not, but everyone was uniformly kind. I'm aware that most people sincerely want to help, and it was great to have this potent reminder. The essay had to be between 2700 and 3300 words. I thought my largest problem might be in keeping under the word count. After all, I remember writing papers of double and triple that length in grad school. Nope--my essay came in at just the right amount, and there were days when I thought I might have trouble getting to the minimum. That was a fear of mine when I wrote essays in grad school too. Notice, though, that I said days. Yes, it took me days to write this essay. In grad school, I would routinely finish several papers in a week, or even a week-end. Of course, I'd done more researching and planning and preparing--there was less writing to discover what I had to say. The benefit to a longer writing process: I could return to the writing and say, "Wow. That's clunky. Jeez--there's no transition between these chunks of the essay." I could say, "This bit is interesting, but it's off topic--throw it out." To be honest, I didn't make those kind of cuts until the end. Just like when I was a grad student, I wanted credit for all the work I had done. I twisted that chunk into all sorts of shapes trying to make it fit, but in the end, I had to admit that it didn't. I felt oddly proud of excising it. I even wrote a poem, because I needed an example to support a point. Perhaps I shouldn't admit this. I can hear graduate school professors recoiling in horror. But I thought it was kind of cool. My immersing myself into the topic left me inspired, and it was neat to be able to use one of the poems that I had written in response to the academic writing I'd been doing. It's good to do this kind of writing again, to remember what it's like to do it, to have a bit of a taste of what our students go through. It's good to feel the achiness of these writing muscles--and good to feel them limber up again. First, a disclaimer. When I was a sneering adolescent, I didn't understand the impulse to send out a Christmas letter once a year. In some ways, my parents encouraged my disdain. One year, my father wrote a mock Christmas letter, a stunning satire, which we didn't mail, but we enjoyed helping him revise. My dad was in a dark place, workwise, which was a strain, and I remember that composing/revising process as one of sublime joy: we could still laugh together as a family. Maybe good times would come again. One of our family Christmas rituals was looking forward to certain Christmas letters. One of my parents' friends wrote Christmas letters that contained incredible detail, down to which Bible passages her study group examined through the year. Some Christmas letters were so brief I wondered why people bothered. Some of these letter writers also wrote or called us throughout the year, so I wondered why they felt compelled to sum up their lives in a yearly Christmas letter. Now, I feel slightly ashamed of my sneering adolescent self. Now I am older, and I treasure these Christmas letters that my friends write. I treasure them because I never get around to writing them--yet I'm thrilled to find out what my friends have been up to. I sense a similar sneeriness that some people have towards Facebook, Twitter, and other types of social media. I hear people say that we're all too self-absorbed. Who could be interested in our puny lives in all its stupid detail? Well, I am. Many of us aren't living lives that can be transfigured into long, chatty e-mails. And if we live fascinating lives, many of us don't have time to write long e-mails or old-fashioned letters on paper--and if all of my friends did write long, lengthy e-mails, I might have trouble finding time to read them all. In some ways, I miss that depth, that insight into people's lives. Yet, I'm always happy to read a sentence here or there about what people are up to. Tell me about your school and the tests you're studying for. Tell me what your kids are up to. Tell me what you're reading, watching, or listening to--I need suggestions! Tell me about your garden, your chickens, your leisure-time activities and all the ways in which you try to make your real life match your values, and I'll be inspired. Give me a daily smile as I see a photo that you took that's important to you and yours. Will these weekly and daily updates some day supplant the yearly holiday newsletter? I doubt it. I still like seeing the year-end summary, and I suspect people still like writing them. If I didn't want to be flamed by all my sociologist friends, I might even hypothesize that we're hardwired as humans to be retrospective at certain times. Or maybe I'm the only hard-wired one. I'll certainly be looking back and looking ahead, as this year draws to a close and a new one begins. I'll be dreaming: what do I want my life to look like in one year, five years, ten years? And then I'll write it down. I do believe that the writing it down makes it more permanent, more likely to happen. I'm always amazed to go back to read what I envisioned--and how often, my life calibrates towards that vision. It's a valuable exercise. Some of what I want doesn't seem to change much: to eat more fruits and vegetables, to exercise more, to be more intentional with my time and finances. I want to send more of my writing out into the world. I want to write more rough drafts. On December 31 or January 1, I will post more specific writer's goals for the year of 2013. And then, in a year, we'll see how I did. to make one last stand. Long ago, before my sister had her child, my mom, sister, and I used to hit the after-Christmas sales. Often we'd go on Dec. 26. Some years, my mom would buy our Christmas presents as we shopped. We had less to open under the tree, but as older girls and women, we understood that we'd end up with more gifts. We'd hit the mall early and have a morning coffee break, a leisurely lunch as we made our final decisions, and then we'd drive home, tired but happy. Even if you don't want to take advantage of Christmas sales at the mall, it's a good time of year to stock up on your holiday supplies for next year. Holiday cards don't really change--buy them now, while they're 75-85% off. Likewise for ribbon and wrapping paper. I love the smell of Christmas candles all year round. They're super cheap right now. Have you had your eye on any special decorations? Go ahead and splurge now. And you don't have to brace yourself to go to a mall or to some superstore. I've often made great purchases at Jo-Anns (our local cloth shop that's a chain), Michaels, and other arts and crafts stores. Likewise, your bookstore might be having great sales. Of course, if you don't store everything in one place, you might want to make yourself a note. I remember that one year I searched high and low in my 10 x10 foot office as I couldn't remember where I had stashed the departmental cards for next year. Now I make a reminder note in early December in my Outlook calendar. I'm not a big fan of mindless consumerism, but I am a fan of strategizing to save money--and by strategizing now, perhaps you're also giving yourself the gift of time come December 2013. I hope your Christmas day draws bright, regardless of the weather. I hope it's full of everything you love! What if the Virgin Mary Could Have Had a Sonogram? This time of year often takes me back to the days of my sister's sonogram. Not the routine holiday memory, I know. I didn't actually see the sonogram in December of 2005, but we were in the area, and the whole family went out to dinner on the night that she had it. I think the grandparents were allowed to be in the room during the sonogram too, if they promised to keep the gender a secret. We travelled to the dinner after the sonogram with my parents. It was just a few days before Christmas, so we had the Advent narrative ringing in our heads: the angel Gabriel appearing to Mary, her response. I remember my father saying, "What if sonograms had been invented then? What if Mary could have had a sonogram to see Jesus before he was born?" That idea haunted my head for weeks, and I began to fashion it into a poem. I worried that it might seem irreverent, disrespectful of both Mary and all parents. But I think that some of the best poems feel dangerous in that way. 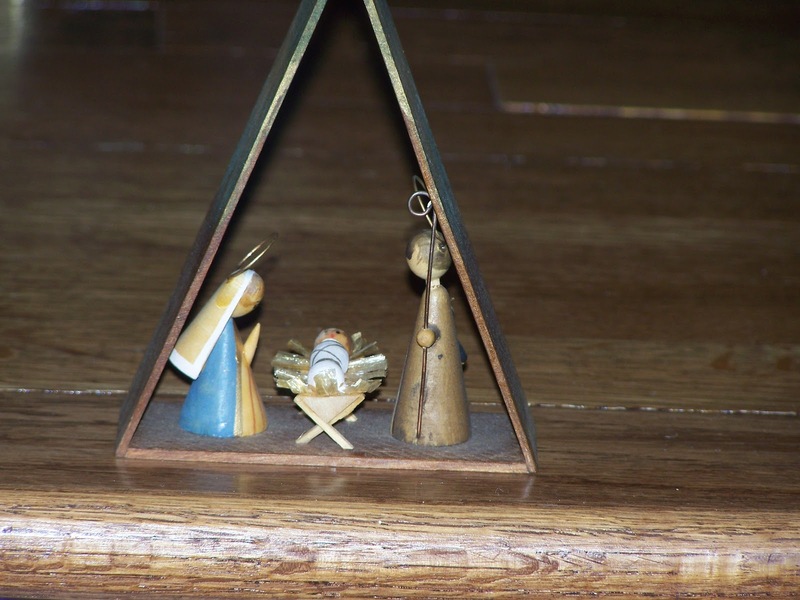 On Christmas Eve, my thoughts often return to Mary, that soon-to-be mother, and all parents. My thoughts return to the wonder of life and how amazing it is that any newborns survive--we start out so fragile and tiny. it, to rain blessings on unsuspecting souls. On a sonogram, all children resemble angelic messengers. shades of green and gray and black. staggering us all with wonder. About that Mayan Calendar . . . I made the last Mayan calendar. You wonder why it ends so abruptly. I got tired of all that carving. a new path for my creativity. At night I dreamed of tapestries. in my search for texture. panels of cloth, not stone. that rots in a tropical climate. Are we dead yet? Is the world still here? I'm willing to bet that we are still here. I'm willing to bet that the sun will rise on a new day, just as it has done on the day after the world ends so many times before. I know, I know, the Mayan calendar came to a halt yesterday. In addition, we've had some kind of galactic alignment, something about our solar system coming as close to the middle of the Milky Way as it will ever be. Wait, I've heard about Harmonic Convergences before. What does one serve for dinner on the day that the world didn't end? We've been granted a reprieve. Create a menu! For those of you wanting a more detailed, less tongue in cheek, more science-based explanation, see this post. For the rest of us, I think we should write a poem. Why did the Mayan calendar end? What happened to the calendar maker? Or write a poem full of energy and zest. Make those words come into alignment. Write a short story set 100 years in the future when people fully understand the import of the Mayan calendar. Or write a short story set thousands of years in the future, when future beings look at some artifact from our time, and create a grand mythology around it. Would that artifact be something terribly mundane, like a collection of coffee mugs from tourist sites? Or would it be something that has import that's hidden to the vast majority of us in our time period (I'm looking at my collection of poetry collections and literary textbooks). Or maybe you're tired of words and you want a more visual prompt. Well, take a calendar page of any size and create your own, illustrated calendar. You say you can't draw? Draw with colored markers and enjoy the gush of ink. Or put together a collage. Tomorrow: my poem about why the Mayan calendar maker stopped at the year 2012. Will today be the last day of the world? For those of you expecting that your local Apocalypse Gal would have something eschatological in nature, I'd direct you to this post that I wrote for Her Circle. What was that Mayan maker of the calendar thinking? My post for this Sunday may shed light on that. In the meantime, let me record some snippets from my own December calendar page. --Are you celebrating the Winter Solstice today? We're expecting our first seriously cold weather down here at the southeast tip of North America. Finally! It's hard to feel festive in the traditional ways when the temperatures are getting close to 90 degrees. --I saw a bougainvillea tree with extravagant fuchsia blossoms. Someone had hung huge glass and metallic balls on it. A tropical Christmas tree! 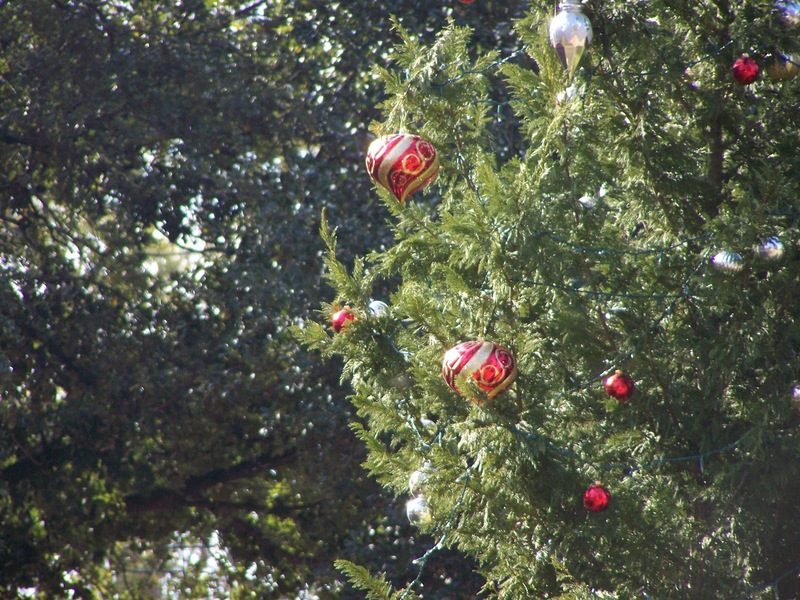 --Early in December we saw our backyard neighbor stringing lights in his huge mango tree. Twinkling lights in the mango tree--seems it should be a metaphor for something. --I do love the ways that people string lights in their palm trees. --But I also miss evergreen trees. --I saw a powder blue convertible. The driver had a Santa hat and a sparkly top, but I couldn't be sure of the gender of the driver. The driver in the Santa hat seemed to be having an argument with someone. It was very disconcerting to see a gender ambiguous Santa yelling angrily into a smart phone while driving aggressively. --Yesterday I went with my German friend to the heart of Miami. She needed to get her passport renewed at the German consulate, and even though she's a world traveller, driving in Miami unnerves her. I understand. It's much easier to have a navigator along. --We zipped right downtown--no morning commuting traffic slowed us down! We found a parking place right at the building which houses the consulate. It couldn't have been much easier. --Because we were so early, we lingered at a Starbucks. I wondered if we were near any places that would have served us an authentic Cuban breakfast, but I didn't see any. --Still, it was interesting to do people watching at the Starbucks in the heart of downtown Miami. Lots of VERY high heeled shoes on the women. Even the people in their exercise clothes looked glamorous in a Miami way. --My friend and I discussed city living. If I had lots of money, I'd move to the heart of a city in a heartbeat--any number of cities call to me: Miami, D.C., New York, Chicago, Seattle, San Francisco. But I don't have lots of money. My friend is perfectly happy in her suburban house. --From the 22nd floor of the building that houses the German consulate, we had a great view of Miami: the towering buildings, the rooftops of the shorter buildings. I could see the beautiful pool area of a huge condo building. Despite it being a beautiful morning, no one was swimming. --All these things I have seen, but with no camera to record it. My words will trigger my own memory. Hopefully, your imagination will create a visual too. --My friend wrapped up her business and we zoomed back up to our home county (Broward, not Miami-Dade). We had coffee and bread I'd frozen from Santa Lucia Day baking. And then it was back to mundane life. --Yes, mundane life: running to Target, cutting some cloth strips for a church project (see this post for more on that), making a simple supper. I remind myself that even if I lived in a downtown city, I'd still need to do mundane things, like picking up prescriptions and making dinner. --It's the end of a Mayan cycle: may your next baktun be even better than the last one that's ending today! Because I worked long hours on Monday and Tuesday, I was able to leave a few hours early yesterday. If I had planned a bit better, I might have stopped by the library to get a movie or two for us to watch. Ah well, that's why we have home collections, right? Yesterday, we decided to watch Good Morning, Vietnam. Not exactly Christmas viewing, but it worked out. Besides, we watched A Charlie Brown Christmas on Tuesday night, and once you've seen that, all else pales in comparison. I first saw this movie back in 1988. I had taken a vow after seeing Platoon that I was done with Vietnam War movies. But since Good Morning, Vietnam starred Robin Williams, I made an exception. Then and now, I think that the movie does a good job of showing the complexity of that war, especially as it was lived by servicemen (and there were no servicewomen in this movie) on the ground away from the main fighting. When I first saw the movie, I had just taken an upper level Sociology class on the conflict. I thought I could take that class and understand the war once and for all--ah, the naivete of youth! I watched the movie and primarily reflected on the experience of the Vietnamese and how it must have felt to have your country invaded, first by the French and then by the U.S.
As I watched yesterday, I thought about the doomed romantic feelings of Adrian Cronauer for the young Vietnamese woman. I realized that he wasn't offering her anything like marriage; he just wanted to hang out with her. She knows that proper young women don't do that, and she rejects him. But what if he had wanted to marry her? Would she have been better off? I'd have to research that more. After so many decades of war, would a communist regime feel that bad? Would it be better to leave one's homeland if it meant freedom? But would freedom be worth the cost of being the eternal outsider? I also thought about the timeline of the movie and the making of the movie. The movie is set in 1965; it's made in 1987, 20 years later. We know how the conflict ends, which must have informed the making of the movie in many ways. Would Cronauer's friend who turns out to be a terrorist/freedom fighter really have argued his case so eloquently? Would it really have been possible for them to develop any amount of closeness or was it just a convenient way to insert that politicized speech into the movie? I've been hearing a lot about the film Zero Dark Thirty, and as I watched Good Morning, Vietnam, I wondered how filmmakers would be approaching the wars of the Middle East in 20 years. What will we know about those conflicts in two decades that we don't know now? I also kept thinking of this classic bit from The Princess Bride: "You only think I guessed wrong! That's what's so funny! I switched glasses when your back was turned! Ha ha, you fool! You fell victim to one of the classic blunders! The most famous of which is 'never get involved in a land war in Asia,' but only slightly less well-known is this: 'Never go in against a Sicilian when DEATH is on the line!'" We still don't seem to be able to remember that lesson. Here we are, 47 years after the year in which Good Morning, Vietnam is set, and we're involved in not one, but two land wars in Asia. Sigh. It's probably time to return to Christmas viewing. 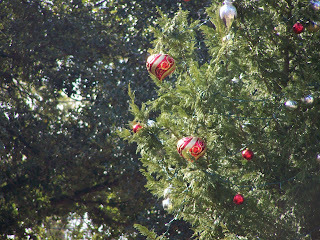 I need that message that A Charlie Brown Christmas gives me, that Advent message that love redeems us all, from the most meager manger in a distant outpost of the Roman empire to the skimpiest little pine tree to the boy who thinks that Christmas is a holiday designed to remind him of his unworthiness. I've been submitting my poems to the literary magazine Field for decades now. For most of that time, they came back with a rejection slip in my self-addressed, stamped envelope; the last few submissions were done electronically, but the overall message was the same: no thanks. No comment, no encouragement, and yet I kept submitting through the years. Yesterday, I got my first personalized rejection: "We're declining these. Note that the submission letter is addressed to a different magazine." Well, that's embarrassing. At first I felt horrible: mortified and oh, so stupid. And then I tried to console myself. I've been submitting for decades and seen no signs that anyone there likes my work. At least I didn't burn a bridge with a journal which had seemed like it might maybe some day like my work. I did doublecheck, and yes, I did have the wrong cover letter attached. I'm unsure of how that happened. Basic sloppiness. A tiredness. Probably trying to get one last submission done before I called it quits for the day: Cut, paste, forgetting to proofread--sigh. I tried to console myself by reminding myself that we're all human. Once, long ago, I got a rejection envelope and when I opened it, I discovered a packet of poems that weren't mine. I wondered if that same poet had gotten my poems or if there was a cascading chain of poems going to the wrong poets. I read the poems, wrote a nice note, and put the poems, my note, and rejection slip into an envelope and mailed it to the poet. I had a brief vision of a grown up, pen pal kind of exchange, but I never heard anything. I never did get my poems back. I hope they found a nice home. Yesterday, I decided to make some submissions, just to get over my fear of repeating my mistakes. And happily, I had a contributor copy of Poetry East to remind me that sometimes my submitting strategy goes well. What a gorgeous volume. It includes work by the painter Makoto Fujimura, an artist who has done interesting work with a spiritual theme. That sounds so bland. He's done successful, powerful work that's openly Christian. Those of us who wrestle with the best ways to explore artistically our spiritual lives know it's not an easy task--so many ways to go terribly wrong. My poem, "Horarium," is in this volume of Poetry East, along with works by some of my favorite poets, like Kathleen Kirk and Michael Hettich. I've only just started exploring, but it looks like many treats are in store. Here is my poem, "Horarium." I found it strangely comforting to revisit it yesterday. It seems appropriate for the hectic holiday season which has become so marked with bad news. the quickest way around the traffic jams. welcome visitors to a meal. channels, our glazed eyes focusing on nothing. of holy water and a benediction. Yesterday, I met with a group of colleagues who write poems. We had a prompt of 3 words (milk, crowded, eye) and we gathered with our poems. We had Santa Lucia bread and coffee. I'm lucky to work in an environment where it's OK to gather around bread and coffee to read poems. Very lucky. I wrote haiku-like things (haiku in the sense of syllabics, but very little else). I envisioned them as separate units. As we talked about them, we realized that they also work together as a single poem. tears, a film of milk. One woman brought a poem she had written earlier as she worked on a painting. Was it also in response to T. S. Eliot's "The Hollow Men" or did it just reference it? I can't remember. We talked about Eliot and his mad wife, Viv. We talked about Zelda Fitzgerald and F. Scott. We speculated about the role of the poet and the mentally unstable partner. And then, one women printed a copy of "The Hollow Men," and we read it out loud. We took turns. It was so amazing! One of the reasons I've always said that I love teaching is that it's one of few professions that allows me to read poetry out loud. But I'm always the one reading it. I had almost forgotten how wonderful it is to hear others read it. I don't have students read because I understand that so few of them like to read out loud--they're just not skilled that way, and I can't bear to have the poems butchered. We talked about what the poem means. Having just written my essay about female poets and the world of work, I was inclined to see the hollow men as corporate suits, hollow inside. One of my colleagues saw the hollow men as scarecrows. We also talked about the hollow men as guides on the way to the spirit world. We now have our new writing prompt. We will write a poem in response to "The Hollow Men." Maybe I'll write several, or maybe, like Eliot, I'll write some shorter pieces that link together. I noticed that at the end Eliot uses this line: "For Thine is the Kingdom." I started making notes about what I'd like to include: a bit of John the Baptist ("I am not the Messiah"), a bit of Isaiah (so much to choose from) and perhaps a bit from the child's book Madeline, since at my workplace, we spent a great deal of time talking about the importance of 2 straight lines for graduation (I created a line that references a different Eliot poem, "The Love Song of J. Alfred Prufrock": "I am not Miss Clavell nor was meant to be"). We talked about whether or not we're all Prufrock now. I've been feeling a bit of despair, only alleviated a bit by watching It's a Wonderful Life. We talked about that movie and its theme that every life is important. Oh, how I yearn to believe that it is. Sometimes, though, it's so hard "in this hollow valley / in this broken jaw of our lost kingdoms." I translate that piece of "The Hollow Men" as being about the death of our dreams, but perhaps it's more literal. You might think that Eliot doesn't fit with the holiday season, but coming from a liturgical angle, I'd say he's perfect for Advent. Eliot will never be my favorite, but yesterday, to hear that poem and talk about his work--it was grand! This will be a day when some of us return to school and try to forget how vulnerable we are--or, if not forget, to carry on in the face of the knowledge of that vulnerability. Some people will be discussing mental health issues and some will be discussing gun control and some will move on to other issues. It's too easy to let the bad news of the world paralyze us. Let us not cower in fear. Let us return to our creative work. In our despair, we might say, "Why bother? It will all end in tears anyway--and no one is paying attention!" We just do not know. As encouragement, I'd offer this: on this day in 1892, the ballet The Nutcracker premiered. It was not the beloved the way it is today. In fact, today's post on The Writer's Almanac says, "Tchaikovsky died less than a year later, and had no idea that The Nutcracker would become a classic — many people consider it the most popular ballet in the world." All we can do is create the work. We have no control over what happens next. But maybe today you need a creative venture with a more certain outcome. Maybe it's time for holiday cookies. Or maybe you want to cut other shapes (sailboats? flowers?). Or maybe just blobs that you'll decorate whimsically. And so, I offer a recipe that is beloved by many--it's even won a local contest at a recent cookie swap! It's quick and easy--you can roll the dough thick or thin or just press it flattish. Cream butter, sugar, eggs. Add milk and dry ingredients. Roll out to ¼ inch thickness on a floured board and cut with cookie cutters. Sprinkle with colored sugar or leave plain to frost when cool (or to enjoy plain). Bake 10 minutes at 375. Easy frosting: moisten powdered sugar with enough milk to make spreadable and tint with food color. Today is Jane Austen's birthday. I'm conflicted about Jane Austen. I want to like her books, but I often do not. I may be the only English major ever to not like Pride and Prejudice--and no, you may not take my Ph.D. away; I earned it, and I'm going to keep it. The only Jane Austen novel that I love wholeheartedly is Northanger Abbey. If that book didn't exist, I'd think that all Austen scholars were a bit touched. But Northanger Abbey proves to me that Austen is a woman of wit and intellect, and with humor thrown into the mix. I loved that book when I read it in undergraduate school, long about 1986. It wasn't until the wonderful movies based on Jane Austen's books that came out in the last half of the 1990's that I understood the appeal of the other books. Now I understand why people love Sense and Sensibility. And more important, I understand the cultural critique that Jane Austen offered. In her books, it's such a subtle critique that I completely missed it when I first read those books in my late adolescence. In the movies, I saw it finally--and felt it, viscerally. Here's a Jane Austen quote for the day: "Happiness in marriage is entirely a matter of chance." When I first read that quote, I read choice instead of chance: Happiness in marriage is entirely a matter of choice. Those two quotes (one by Austen, one by Berkey-Abbott) show to me the vast difference in being a 19th century woman anywhere and being a 21st century woman in a first world nation. If I had the kind of life I wish I had (one of lots of time and leisure and friends with lots of free time), I'd throw a Jane Austen tea today. We'd have a pot of strong tea softened with cream and sugar, scones, clotted cream, lemon curd, and some cucumber sandwiches. And because I'd be a woman of leisure, I'd have made a beautiful coconut cake (that's why I'd have leftover lemon curd, because I'd be using the recipe out of Moosewood Restaurant Book of Desserts), and because it's close to Christmas, we'd have ambrosia, and I wouldn't care about repeating the flavors of lemon and coconut. Astute readers might say, "Hey, you're sort of describing life in a Jane Austen novel." People who know me well would remind me that I first hated Jane Austen because those female characters didn't seem to have a meaningful life; they just sat around and drank tea all the time and went to a ball here and there. Yes, the very reason I don't have a life with lots of free time and homemade lemon curd and cake is because I rebelled against the world that Jane Austen offered. Jane Austen showed us, subtly but powerfully nonetheless, the danger of that life of leisure. That life of leisure often relied on the support of males, and Austen novel after Austen novel shows us how precarious that support could be. So today, to celebrate Jane Austen's life, I will prepare for the work week ahead. I'll do some laundry and reflect on how much I love my 21st century clothes--and the washer and dryer that take care of them. And I'll have some tea, and since I have lots of Christmas cookies in the house, I won't make scones. I'll lift my tea cup to women like Austen who paved the way for generations of women writers who would follow in her footsteps, women like me. Yesterday as I drove home, I listened to the news conference where the bad news was confirmed: 20 children dead in the second deadliest shooting incident in U.S. history. I had heard whisps of news throughout the afternoon, but I had hopes that the news wouldn't be that bad. I clung to the word "unconfirmed." But as it was confirmed, I cried. I cried all the way home. I thought about Psalm 23 and that line about fearing no evil. Oh, but I do fear evil. I prayed for those families who will be having the worst Christmas ever. I prayed for us all. I had a Christmas cookie exchange invitation; the event was last night, and I still had sugar cookies to decorate. What to do in the face of evil and tragedy? 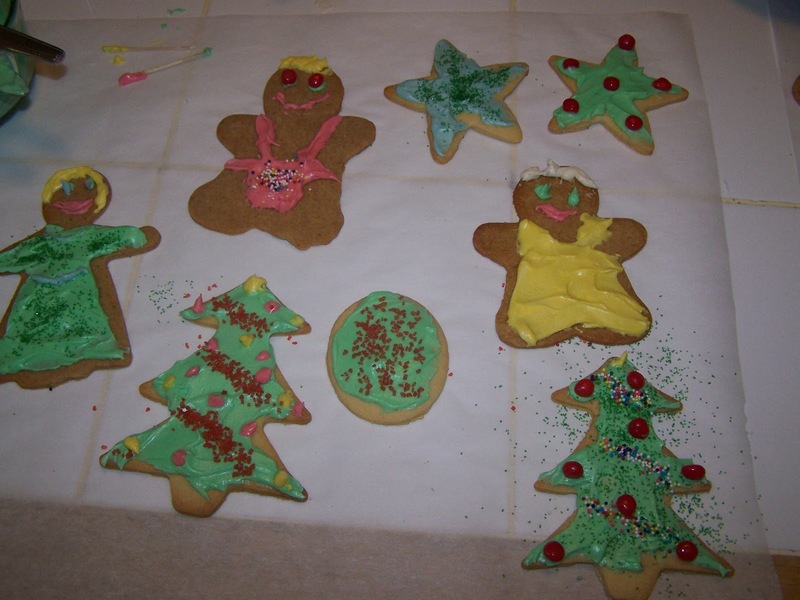 Remember the promise of the Scriptures, pray, and decorate cookies. It seemed a bit profane. But then again, it seemed like a life affirming thing to do. I decorated cookies and went to exchange them. I lingered in a dining room that had more cookies in one place than I've ever seen in one place--even bakeries don't usually have such an assortment--plus we had almost no duplicates! About half the cookie exchangers had brought their children. We didn't talk about the tragedy that had happened at the elementary school. We drank wine and ate festive appetizers and chose our cookies. What fun! Again, it felt a bit disrespectful. And yet, it also felt important. Evil will make an attempt to creep/smash into our lives in all sorts of ways. How to defeat the darkness? With community, connection, sweetness, and light. I got home, and my husband and I lit the candles of the Advent wreath. We read Isaiah 61, that ancient prophecy with its promise that God will bring beauty out of the ruins and new life out of the devastation. And then, this morning, I saw that my piece had posted at Her Circle. Back in early December, when I wrote the piece about apocalypse and how to prepare for it, I hadn't realized, of course, that such a tragedy would occur. But this morning, it seems the perfect reading for such news: "The Protestant reformer Martin Luther says that the proper response to knowing that the world would end the next day is to plant a tree (referenced in N.T. Wright’s Surprised by Hope: Rethinking Heaven, the Resurrection, and the Mission of the Church p. 209). That advice is as good today as it was 500 years ago. The theologian N. T. Wright would tell us when we need encouragement to do great and/or beautiful things, to remember that it all becomes part of the ultimate redemption of the world." My piece talks about a variety of responses from social justice work to artistic creation. Plus it's got amazing pictures, and let me hasten to add that I only wrote the text. I'm sure that we'll hear the usual talk about gun control. I wish that we would talk more about mental health issues and how to get people the care that they need. I also know that even if we had the best resources, it's tough to get disturbed people to take advantage of them. These stories grab our attention because of the high body counts, but it's important to remember that we're not likely to be a victim in this kind of scenario. One-on-one gun violence is much more common. But I'm not convinced that changes in gun control laws would change those statistics. We have tighter gun control laws than we did in the 1970's and 1980's, but the violence seems worse. However, it might be because of media saturation. I haven't looked up actual statistics. In my younger years, I might have protested. I might have written letters to legislators. In what I hope are my middle years, I'll decorate cookies and smile at the antics of children who spent the night sneaking cookies off the dining room table. I'll say prayers and write posts like this one at my theology blog, posts which I hope will give comfort to those who are frightened. I'll make a seafood stew for my quilter friends who will gather at my house later today. And I'll stitch baby quilts which the women's group at my church will give to indigent mothers. I will fear evil, but I won't let that fear cripple me. I will devote myself each and every day to creating light in the darkness. I will trust the Advent news that redemption is on its way, that the darkness will not overcome the light forever. I got to my office this morning to discover a bottle of wine in a holiday gift bag from my boss. It was sitting on my desk. My first thought: "How nice." I sat down and got the computer started doing its security stuff. My second thought: "What does my boss think about me from looking at this desk?" Don't get me wrong, there's nothing incriminating or unusual on my desk. But still, my boss rarely makes it to my office and even more rarely comes inside. What does my office look like through his eyes? Here's what caught my eye: the first page of a short story I've been working on. The rest of the short story is on the small table by the door. What likely happened is that the first page fell to the floor as someone (me or my boss or the cleaning staff ) walked by it. That means that someone picked it up. My boss? Did he read it? Happily, even if he did, it's not a bad first page. I'll paste it below in case you're curious. What else would he see? A mug with James Joyce on it and a mug with Jane Austen on it (when you add hot liquid, she turns into a zombie!). A page with financial calculations, but it's unclear what I'm trying to figure out; I know it's my charitable giving, but I'm not sure anyone else could decipher my notes. He'd have seen several stacks of poetry books that I haven't put away since finishing my academic-ish essay last week. There's about 20 sticky notes with all kinds of reminders. There's Tictacs and hair clips and a bag with beads from a bracelet that broke. On the wall is my Simple Lifestyle calendar from the Appalachia Science group that I've been supporting since my undergraduate days. This month's picture is two older women making corn husk dolls. 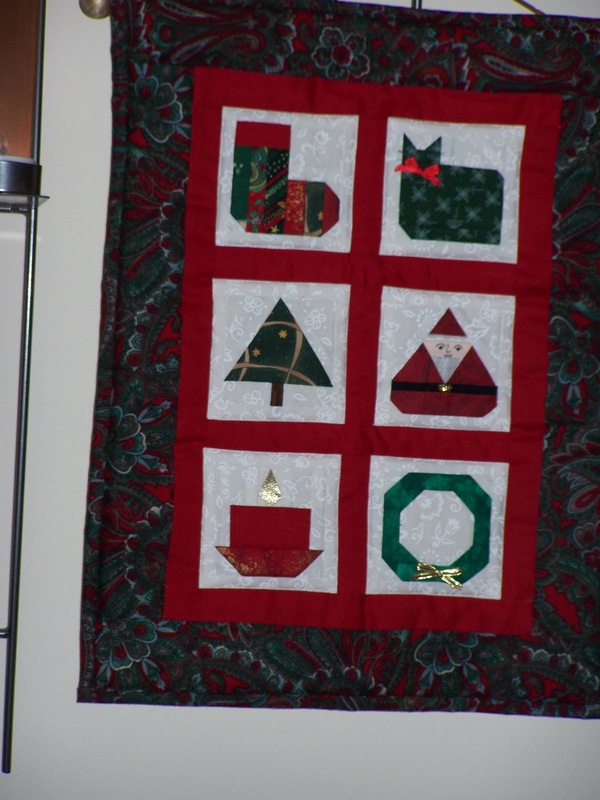 My walls also have fabric art that I've done and a painting or two, plus some Christmas crafty things: a wreath, a plastic canvas picture of a tree done by my Grandmother, a counted cross stitch piece I did in grad school. My office really reflects my personality: creative and pulled in many different directions. My boss knew my personality when he offered me a place in the reorganization. Some might say my office is messy. I would concede that point. But I'm surrounded by things I love and things that remind me of who I am and things that remind me of what's really important. Now, on to things that truly matter--and if this first page pulls you in and you want to read the rest, let me know. I'll be happy to make arrangements! “I’m sorry, Dad. You said you want to go where before you die?” Adam asked. Adam listened to his father’s plan, about how they’d go in early October and stop at an apple festival that his father hadn’t attended after his mother died, but they used to go every year without fail. They’d go to Graceland, and if Adam had time, maybe they could even go to Vicksburg. “You’re into Civil War sites now?” Adam asked. Bake Bread for Santa Lucia Day! Today is the feast day of Santa Lucia. While I've written much about this day on this blog and on my theology blog, I have done some searching and realized that I never posted the bread recipe that I use. Before we begin, if you'd like to have pictures to guide you, or you're simply in the mood for a photo essay, see this post from last year. If you'd like a more theological meditation, see this post. Put the yeast in a big bowl with the warm water and a pinch of sugar. Let it proof (get foamy). Add the remaining sugar, evaporated milk, eggs, salt and mixed spices: blend well. Add the butter and 3 c. flour and stir until smooth. Stir in the remaining flour and mix into a soft dough. Cover the bowl and let the dough sit for 30 minutes. Turn the dough out onto floured countertop and knead until smooth, 5-10 minutes. If you're using raisins, add them in. Let the dough rise until doubled. The dough will be easier to handle if put in the refrigerator for an hour or even overnight. Divide the dough into 3 pieces. You can make three braided loaves or you can make a variety of smaller buns and pieces. For a wreath or long braid: take each piece of dough and divide it again into 3 sections. Roll each section into a long rope. Place the long ropes side by side and braid. 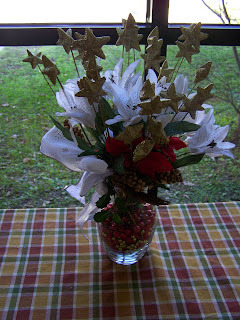 Leave it long or place it in a round, wreath shape on a greased cookie sheet. Other shapes are produced in much the same way, but with smaller pieces of dough. Roll into a long rope and curl it into an S shape, or a C shape or a cross or the curled horns of a bull--whatever pleases you. Let the shaped dough rise again until doubled. Brush with egg wash and bake in 375 degree oven: 20-25 minutes for the wreath/long braid (depending on thickness of braids; if they're very thick, you may need longer yet), 15 minutes for the buns. An inexact way to tell if its done: the bread should sound hollow when you thump the bottom. Baking purists will be horrified, but I have been known to stick a knife into the bread, just to be sure. --Ravi Shankar has died. I didn't know much about him, and on my list of favorite musical instruments, the sitar occupies a lower rung. But I'm struck by how many important musicians have died this year after making it into their late 80's and early 90's: Earl Scruggs, Doc Watson, Dave Brubeck, Ravi Shankar. Is there something about the music that helped them survive so long? --My local NPR station is having a fund drive. My first thought: Really? Didn't you just do this in October? But I know that it's the end of the year, and people are more likely to give as they think about the charitable giving deduction that they'll need for tax year. So, fine, fund raise away. --I switched channels this morning. On a local hard rock station, I heard d.j.s blathering away about some study that talked about what women expected in terms of gifts from their husbands, boyfriends, and significant others. I was flabbergasted! --1% of annual income = amount of $ women expect their male partners to spend on Christmas presents for them. But wait, it gets worse. So much worse. --What do women want? Well, we finally have an answer. Number 1 choice: designer shoes. Number 2: designer handbag. Number 3: a pet. Number 4: designer coat. --Excuse me. I need a minute to go and vomit. And to remind myself that I have no idea about whether or not this survey is real. For all I know, the d.j.s just made it all up. --But it BOTHERS me that anyone could think that a woman wants her man to spend hundreds and hundreds of dollars buying her designer crap that is probably a duplicate of what she already has in her closet. --I know that it was a morning drive kind of program, but I still yearned for someone to bring up the morality of it all. If you're going to spend hundreds of dollars, buy me a book, and give the rest to a charity, preferably one that works in the third world. Send your money to Africa to drill a well (Clean water for Christmas! it has a certain ring). Buy a cow or a chickens for a family or a village. I have so much, and and it's hard for me to sleep at night knowing that so many have so little. --I realize I'm a different kind of woman than the kind that the d.j.s were discussing. But am I the norm? It depresses me to think that the woman who demands presents, and very expensive presents at that, might be the norm. --I also realize that there may be a bit of hypocrisy here. I'd like to say that I'm donating as much to charity as I am to my retirement account. I'd like to say that I'm giving to the third world double or triple what my household spends on wine and beer in a month. I'd have to run some numbers to be sure, but I doubt that my charitable giving is what I wish it could be. --Am I more morally pure because I spend my money on retirement funds instead of designer shoes and handbags? --Why do we equate love with gifts? A question for a different post. --I am seeing more Christmas lights on more houses, lights left burning all night. Perhaps it is a sign of people feeling hopeful about their economic circumstances. 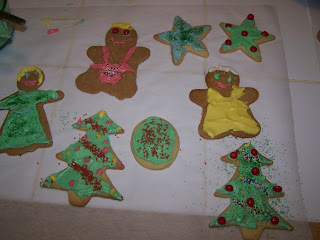 --Today I shall make the first batch of Christmas cookies. I made fudge back in November, but no cookies yet. I'm going to a cookie swap, and I need 6 dozen. Fun! --The trick will be creating enough cookies so that I have 6 dozen cookies left by cookie swap time. How many extra do I need to make? --I will also be working on the dough that will become Santa Lucia bread tomorrow. --I shall be festive, I shall! Despite the strange weather, the humidity, the threat of thunderstorms, the heat, yes, despite it all, I will cultivate a holiday spirit. Bookgirl has written a great post about Christmas pageants and the pageant her church just had. It made me think of Christmas pageants of my childhood, which took me back to a poem that I wrote, which led me to reflect on the publication trajectory of that poem. In December of 2001, I got the happy news that The South Carolina Review would publish my poem, "Medieval Christmas Pageants." It was a spot of good news in a gloomy Christmas season. My mother-in-law fell and broke her shoulder two weeks before Christmas. She lived down here, about a half mile from us. I was taking her back and forth to doctors and playing nurse. She was not an easy patient. I remember getting the mail at my house, after slipping away to do errands. I opened the envelope and read the good acceptance news. I felt euphoria for a brief moment, and then it was back to drudgery. That poem became part of my first chapbook Whistling Past the Graveyard, which would arrive on my doorstep during the Christmas season of 2003. I was so thrilled with that chapbook, and I think it still holds up well. I dug out my contributor copy of The South Carolina Review this morning. 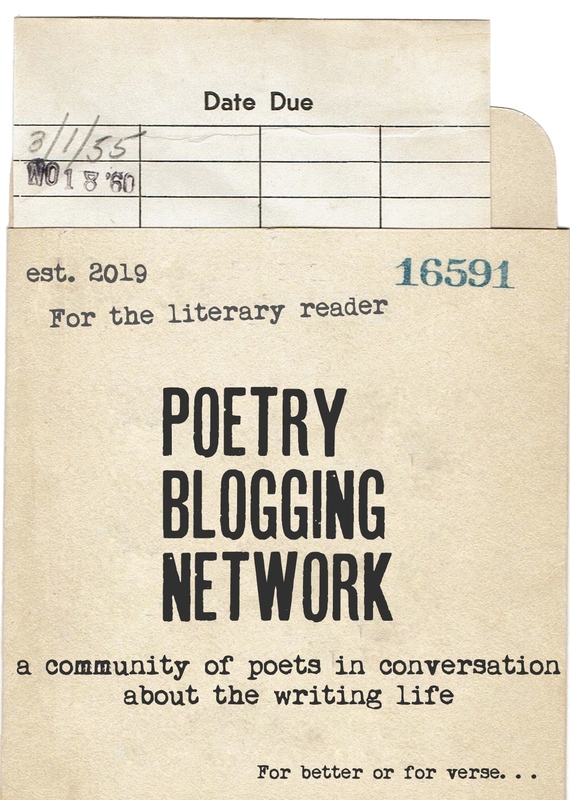 My contributor note says, "Kristin Berkey-Abbott has a doctorate in English literature and has been published in over thirty journals and reviews." Let me take a moment to reflect on how much has changed. When I submitted the poem, I was working a variety of adjunct jobs, and I'd had no book-length publication. When I got the acceptance letter, I was about to start my job at the school where I still work; I wouldn't have dreamed that that teaching job would lead to my current administration job. That administration job has led to many writing projects, blogging chief among them, and my memoir-to-be. I could even make the argument that many of the poems in my 2nd chapbook, "I Stand Here Shredding Documents," wouldn't have been written if I hadn't been working as an administrator. But, Christmas approaches, and I suspect that even the least spiritual amongst us may find themselves attending pageants so that they can support the efforts of the children in their lives. This poem reflects my own experience. I wonder if it still rings true to a twenty-first modern generation? man who knew how to fade into the background. angel, standing shoulders above the others. me to the realm of the angels. player, vessel for the holy, keeper of the cosmic. I didn’t understand the power of my position. worlds emerge, so do new tortures with the triumph. scaring mere mortals into submission. and long robes to ruin my long legged run. no head angel power for us. on her kneeling knees, her bowed head. my Teutonic bones into the Mary model. --Today is Emily Dickinson's birthday. Last year, I wrote this blog post about her. If you'd like a podcast of some of your favorite, 21st century poets (including me) reading Dickinson's poems and talking about her, see this wonderful offering that Dave Bonta put together in 2010. --If you've used Google today, you'll know that it's the birthday of Ada Lovelace, and the drawing does a good job of showing how we get from her work to modern computers. What the Google drawing doesn't tell you is that Ada Lovelace is the daughter of Byron. --Yes, that Byron, the "mad, bad, and dangerous to know" British poet, one of the most famous of the Romantic literary time period. --Ada Lovelace is not the daughter of Byron and his half sister, but of Byron and Annabella Milbanke, the ill-fated marriage. For a variety of reasons, none of them having to do with Byron, she grew up studying math and doing equations. She also wrote--not poems, like her famous father, but papers on math and translations of other mathematicians. She collaborated with fairly famous mathematicians, like Charles Babbage, who called her "The Enchantress of Numbers." --We sometimes forget how the 19th century was an age of science, math, and exploration, and most of us were never taught how much of that work was done by women. In so many ways, it was the dawning of a new age, and women were able to slip through the doors before their way would be barred a generation or two later. --If we knew more of these early stories, would we see more women in the STEM fields? --Of course, here in the U.S., we don't see many students of either gender interested in the STEM fields. But I've just spent several days with young children, all of them under the age of 6. Children don't start out life hating science and math. How can we continue to encourage their curiosity and explorations? How can we make the later years of school more like the first years of school? More hands-on fun, less boring lectures: that would be one way. --Or maybe our changing planet will compel more students into Science classrooms. Our heat index for today: 90 +. Granted, it's South Florida, but it feels unusually warm, even for us. Last week, we saw temps in the 70's in more traditionally cold places like Chicago. Our planet is in trouble. --It would be more accurate to say our habitat is in trouble. The planet will likely be fine. But the habitat that humans need will be shrinking dramatically in the coming decades. --I would like it to be colder this time of year. It's hard to feel festive when I'm sweating. We watched A Christmas Story yesterday--such lovely, snowy scenes. --It's good to remember that all that snow would need to be shoveled. I'd love to live in a snowy place if I got to sit inside and enjoy the view of flakes drifting by the window. But if I had to shovel the driveway and deal with slippery roads, I doubt I'd be yearning for snow at Christmas time. --A light dusting would be nice, though. --Two weeks from today: Christmas Eve. I will miss this Christmas season. My spouse and I have been doing a good job of lighting the Advent candles and taking a few minutes to reflect and to pray. Maybe we'll just keep going. 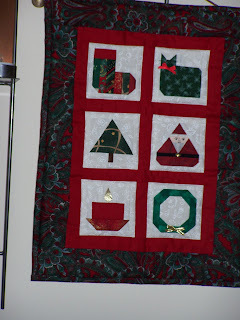 The Advent wreath will become the Christmas wreath which will become the Lenten wreath which will become the Easter wreath and then the summer wreath. --The disadvantage? The Advent wreath won't feel as special next year. The advantages, however, would far outweigh the disadvantages. 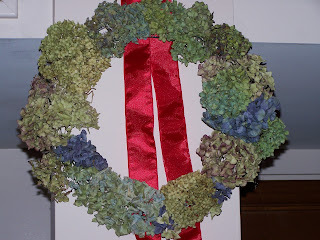 --Perhaps the creation of new wreaths and the continuation of the ritual through 2013 will be my resolution. Let others worry about their weight. Let others measure their worth in words generated. I will commit to the wreath! Last night, we had dinner with friends. After dinner, talk turned to our creative projects and our hopes for the future. The friends come from a social science background, and in some ways, a more rigorous academic background. I got through my Ph.D. program without having to do any math, for example. They can tell great stories about compiling statistics before there were such helpful computer programs. I know more about the current state of publishing and writing than they do--I'm not sure that any of us can predict the future of academic publishing. Academic publishing interests them more than it interests me, although every so often, I dabble in it. Of course, the academic publishing that I do seems easier to me--no pesky statistics to compile--just me and the literature I want to analyze. We talked a bit about blogging, but it's clear to me that I'm the only one who blogs and reads blogs, and thus the only one who thinks blogging matters. I talked about all the raw material I've collected in my blogs and how I might transform it into a memoir. One friend was dismissive. He said, "Forget your blogs. That writing is done, and it doesn't matter. Just you and your thoughts about whatever was happening that day. Who cares? The important question is what do you have to say to people reading now?" In a way, he's right. In a way, he's not, because he hasn't read my blog and doesn't really know what I'm doing here. We talked about memoir, which is hard since I'm the only one reading memoirs. I tried to explain what I hope to do with my memoir: "I hope to be the Kathleen Norris of my generation." Then I had to explain who Kathleen Norris is and what her books are like. I'm not sure I convinced anyone to go to her work, but it was good to clarify what I'm trying to do. Of course, it's easier with friends who have read Norris. My friends are not real open to the idea of spirituality or Christianity; they remind me of Christopher Hitchens in their objections. But we had a good discussion of living one's values in the current work environment. My friend who was dismissive of blogs said, "That's the first idea I've heard that's really made me excited tonight. But take spirituality out of it. Instead, maybe do something with values in the workplace, the values of the workplace." I want to record his idea, because it gives me a way to conceptualize how my memoir might be important even to non-spiritual, non-religious people. I suspect we're all working in an environment that's not exactly in sync with our values, at least not all the time. We all wrestle with what to do when the expectations of our work environment clash with other expectations which are important to us. We also talked about promotion, both of the shameless self-promotion variety and others. We talked about ways to promote our work that wouldn't feel like bragging. I had a moment of insight, when we talked about the differences in promoting different kinds of work. If I can think of my memoir as a tool that will help others to live better, richer, fuller lives, it will be easier for me to tell others about it. I want to make sure I remember this technique. It's an idea which isn't new, of course. But it felt like an epiphany last night. My goal between now and Epiphany (Jan. 6)--to go through the blog posts that I've assembled into one document. Those are the blog posts that I thought might be useful in the memoir. It's time to begin the sifting and winnowing process so that I can start the revising process. Also, I need to see what I have so I can plot out the new writing that I will need to do. By this time next year, I will have a finished manuscript that will be making its way into the world--that's my ultimate goal. And my ultimate wish? I want a bidding war when publishers see my manuscript. I want a book tour that leads to lots of readers discovering my book as a resource that will improve their lives and workplaces. I want new opportunities, ones that I can barely discern right now, to open because of my work. I have a vision of retreats, of new educational settings, of recurring columns in magazines, of clamor for my next work. I'm tempted to erase that paragraph that I just wrote, but I will leave it. I worry that it makes me sound too grandiose, too full of myself. But I also think it's important to articulate these wishes, to send them out into the universe. I do not want a memoir that disappears into the ether. --Thinking I'd buy Dave Brubeck's Christmas CD, I went to Amazon this morning. The CD is temporarily sold out. I thought about an MP3 download, which would be cheaper. But one of the reviewers talked about how delightful the liner notes are. Then I looked at a picture of the cover and thought, I wonder if I already own this. I went to my collection, and sure enough, there it is. I feel that happy feeling of saving money and instant gratification. Thanks, Kristin of the past, for buying this CD and making me happy today! --I started my work week by decorating the school Christmas tree and I finished it by going to the holiday party. Both events made me happier than I anticipated. Very few of us showed up to decorate the tree on Monday, so we didn't have the arguments about design that we might have had if lots of people had arrived, each with their own ideas of how the tree should look. And the holiday party was a luncheon with a full meal that was actually tasty. I had time to catch up with people and to get to know new people better. Wonderful! --After the luncheon, some of us retired to the conference room and enjoyed more talk over coffee that we brewed. The luncheon had all sorts of non-alcoholic beverages, but no coffee--My only complaint. But as we drank coffee, we caught up with some colleagues who hadn't gone to the luncheon--nifty! --A week ago, I did some subdued decorating for Christmas. 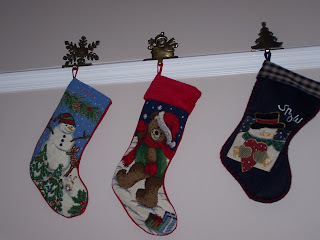 But it makes me happy to see the holiday placemats, the fireplace mantel, the needlepoint picture of a nativity scene that my Grandmother did years ago. --My strange eye condition has cleared right up. So far, the cold that I often get in December hasn't appeared. Hurrah for health! --I finished my essay on women poets and their use of Greek mythology to explore issues of work. I may write a more sustained post about this soon. As with many a piece of writing, it surprised me. At first, my academic writing skills felt rusty, but I warmed up quickly. By yesterday, when I called it done, the biggest surprise was how I had managed to transform it from a clunky piece of disjointed awkwardness to a graceful essay. --Just in time, I got permission from the publisher to quote from Kathleen Flenniken's Plume in my essay. You may be wondering why I had to do that. Isn't it a Fair Use issue? Apparently not. I'd figured out a way to talk about the poems in "Augean Suite" without quoting, but the permission to quote made me so happy. I went back, added quotes, and sent the essay to the editor of the anthology. --I'm the head of a fairly large department, so the issue of buying Christmas gifts for my department members isn't one I wrestle with; I don't make that kind of money. However, I do write a personal note on a Christmas card for each department member. I use the term "personal note" loosely. I write the same note in every card because I don't want to risk anyone feeling slighted. I write: "Thanks so much for all you do for our students, our department, and our school." I sign my name. You might be astonished at how much time that takes. So, I was very happy to get my departmental Christmas cards done and put in boxes before I left last night. I felt like an elf, leaving cards, happy at the thought of people starting their work weeks with a Christmas card. --I'm also pleased with how I've managed to stay sane in terms of our schedule. I have had Decembers where we've been double and triple-booked at social events. This year, I've done a good job at calendar management. --It could make me sad, the possibility that we have fewer invitations this year, but I'm not going to think about that. There may be one or two fewer parties, but for the most part, I'm seeing social events that have been moved which makes it easier on our personal calendar. For example, our church used to do a variety of holiday activities on Saturdays throughout December, but now most of those activities have been moved to Sunday. Having Thanksgiving as early as it's possible to have the holiday helps. --Our campus pastor from our college years was in town, and he came to our house for dinner on Thursday. Words can't really express how wonderful this evening was, but I tried to do it justice in this blog post. We had a great meal, wonderful conversation, and then we lit the candle of the Advent wreath and shared some Advent devotional time. Thursday night was nourishing in all sorts of ways. --Yes, if I had to choose one word to describe this week, it would be nourishing. I've had great meals shared with good friends. I've read lots of poetry as I've written my essay. I've done academic writing, along with a poem, and the start of a short story. I've been successful with my Advent intention of lighting the candle and praying several times a week. I got a great deal on a case of yummy wine. I've been reminded that my workplace may have annoyances, but it's got many benefits too--and one of the most important ones is the chance to work with a wide variety of people, most of whom seem to genuinely like each other. Not much time for blogging this morning. I've got a morning of meetings, and today is the due date for my essay on 21st century women poets and their use of Greek mythology. Perhaps I'll write more about that essay later. I will say briefly that it's always an interesting exercise for me to return to writing that is more academic and analytical. Yesterday I was creating a Works Cited list. I've been creating this kind of document for how many years of my life? And I've taught others this subject how many times? And yet, for a minute, I couldn't remember how. And I had to keep battling my impulse to start each entry with the title of the work, not the author--how strange! And yet useful--it's good to remember the perspective of my students, who find documentation a baffling and arbitrary set of rules. Today is the anniversary of Pearl Harbor, and also the anniversary of my first day of work that wasn't babysitting. Yes, on this day in 1982, I started my "professional" life as the salad bar girl at my local Wendy's. I know, I know--Wendy's doesn't even have a salad bar anymore. Good thing I made other career moves, eh? As I've worked on various work-related projects, including this essay writing, there's some part of me that wonders which of my tasks are akin to cleaning up the salad bar. What will lead to better things? What will doom me? If only I had a crystal ball. But I don't, and so I must attend to a variety of tasks in my hopes of not ending up stranded in a career with no future. On that note, let the day begin! Last night, as I drove home after a long day at the office, I heard that Dave Brubeck had died. I said, "But he can't be more than 35 or 40, can he?" But of course, he was older, much older. Today would have been his 92nd birthday--he lived almost 92 years, and he continued to play and perform almost until the very end. Those of us who have grown up with his music already established forget how revolutionary that music was when it first appeared. He used time signatures almost never used in music and pulled it off. He mixed time signatures within single pieces--again, almost never done, and again, he did it brilliantly. His band was integrated before many bands were. In fact, this wonderful article in The Washington Post observes, "During World War II, Mr. Brubeck was pulled from the infantry by an Army colonel, who asked him to start a jazz band to entertain troops on the front lines. The group was perhaps the only integrated military musical unit during the war." Dave Brubeck wove world rhythms into his music many decades before world music would be popular. He broke down all kinds of barriers, and still managed not to alienate the average listener--not an easy feat. What's even more amazing is that he did what he did even though he couldn't read music. Here, again, we have an example of an artist taking what might be a crippling weakness and turning it into a strength. My students are amazed that jazz music used to be seen as subversive. I tell them that if we were in a college classroom in the 1950's, that most of them wouldn't even be in class together, and we discuss that. Then we talk about the fact that their parents would be worried that their children would sneak off to shadowy nightclubs and listen to jazz--and who knew where that would lead? Now, of course, the parents of students might be thrilled if their children turned to jazz. Some critics would say that Dave Brubeck was one of the forces which made jazz safe and sanitized for the suburbs. But the true story is a bit more complicated, even though Brubeck's life does seem a model of stability unlike most of his peers in jazz. A diplomatic stalemate soon dissolved, and the two leaders signed a historic treaty to dismantle nuclear weapons. I think about how many wonderful musicians we've lost this year, pioneers in folk, in bluegrass, in jazz. I'm grateful that so many of them had such long and fruitful lives. I'm hopeful for the same for all of us creative folks. This has been an odd week. On Sunday afternoon, my left eye started getting filled with mucous. It's done this from time to time since last year, when I had pink eye. I didn't have any other pink eye symptoms, so I thought maybe I was just tired or maybe having an allergic reaction to all the pine boughs I'd worked with during our week-end wreath making. On Monday, the sinuses on the left side of my face seemed swollen, and I had some redness. Still no pinkness in the eye, but lots of tenderness and throbbing pain as the day went on. Lots of blurred vision as my sinuses seemed to be draining into my eye, not my nose. Yesterday was similar. Today I'm feeling better, but still not completely healed. I've decided not to go to the gym, in case I do have an eye infection which is contagious--not good to go and sweat all over everything. I also haven't done any other type of work out. Not exercising frees up lots of time! I've needed the extra time--I've got some writing deadlines this week, most notably an essay on women poets and their use of Greek myth to explore the world of work. It needs be be between 2700 and 3300 words. In some ways, that's not very much. I used to write far more in one week-end when I was in grad school. But it does take time. My essay is becoming more of a writing process essay, exploring my use of Greek myth to explore the world of work. I had thought I'd be writing an academic essay, but I haven't found that many poems that fit my thesis. Oh, there's lots of use of mythology--just not that many poems exploring the work place. No worries--I know how to work with that. I'm composing my conclusion in my head, even as I go about my daily work life of meetings and transcript evaluations and the never-ending issue of e-mail management. This morning I worked on my essay first thing, before I did anything else. We are approaching the zero hour, and I really want to complete a draft today, a goal that's within sight, since I switched my writing practice. Usually I blog first, which can leave me too depleted to write anything else. Or I run out of time. Maybe I'm feeling more capable of writing because I'm not exercising--that, too, can leave me drained. Hmm. Of course, blogging and exercising can also leave me energized and full of interesting ideas. It's tough to get the right balance. Today is a day of many meetings, which never leaves me energized, so I knew I needed to get writing done before I headed in to work. I won't likely be doing any writing this afternoon or evening. There's still a bit of time this morning--back to my essay writing desk! Our church has been doing a series of experiments with one of our services. We've been trying to make it more interactive, less easy for people to just sit there and be more like audience than worshipper. On this past Sunday, we experimented with metaphor and art. Our Bible reading for Sunday, the first day of Advent, was John 1:1-3, an excellent introduction to metaphor. God as word: certainly I can relate to that. But if I was a painter, would I want God to be described as paint on a canvas? We talked about this a bit in our small groups as we completed yesterday's art exercise. We had a big sheet of paper on which we wrote all the things in our world which give light: flashlights, the sun, light bulbs, things like that. We were allowed to write and/or to draw. Then we had two pieces of paper, one white, one black. On that paper, we drew an image that represents Christ. 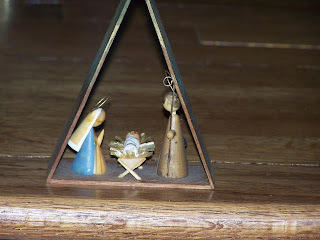 We were allowed to go with something traditional, like a manger or a cross. Or we could be more metaphorical. My group was composed of 2 English major types, 1 scientist, and 3 teenagers (actually, one may be in his early 20's). We had no trouble coming up with a variety of possibilities. My contribution? I said that Jesus is like an asteroid. My group asked me how I came up with that idea. I talked about Apocalyptic Planet, the book by Craig Childs that I'd been reading which talks about a variety of extinctions that the planet has experienced. I talked about the asteroid that crashed into the earth and how that asteroid is thought to be responsible for the extinction of the dinosaurs. The extinction of the dinosaurs made it possible for smaller mammals, like humans, to find a foothold and achieve prominence. One of the people in my small group, the other English major type, said, "You're reading that for fun?" I often forget how strange my reading choices are. She's a friend, so she said it fondly. We continued discussing the idea of Jesus as an asteroid. If it's a big asteroid event, it's violent. We agreed that the violence of that event was problematic. Jesus wipes out the big animals, like the dinosaurs? I said, "Jesus comes to wipe out the dinosaurs of hate to make room for the animals of love to take hold." But a small asteroid event is also problematic as metaphor. Small asteroids bounce harmlessly off our atmosphere. If Jesus was this kind of asteroid, does that work symbolically? We had fun discussing these ideas, along with other possibilities. In the end, our group artist drew a lamb standing on an asteroid. We cut out the image and did a shadowbox kind of thing with the two colors of paper. Why white and black? We talked about colors that reflect light and colors that absorb light and what that has to do with Jesus and the way we respond to him along with the way he responds to us. I must confess, it's the art exercise in which we participate that I remember most vividly. Putting together a drama that demonstrates a Bible story (the house built on sand, the house built on rock) or writing a haiku or drawing an image--that stays with me longer than a sermon, longer than a song, longer than the discussions that led up to the finished project. My brain is not alone in this approach. It's something to think about, for those of us still lucky enough to have teaching jobs and the time to make the classroom an optimal experience. There are neurology and education experts who would tell us that for every 10 minutes of discussion and/or lecture, there should be something more interactive, something that makes everyone a participant. We hold on to what we learn better that way. In the meantime, maybe I'll play with this idea in a poem. Jesus as asteroid--hmm. What's that tail of intergalactic dust burning up behind him? Hmmm. Actually, comets have tails of cosmic dust. Maybe I have more thinking to do. My Speculative Poem in "Rattle"
I've been submitting to the journal, Rattle, for many years now. So, I'm happy to say that I received my contributor copy of Rattle (Winter 2012)--yes, the journal accepted one of my poems for publication in their special section on Speculative Poetry. What is speculative poetry? It can be many things. 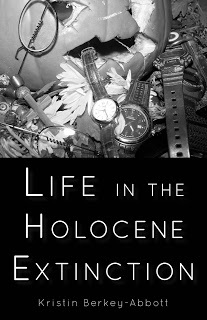 The journal wanted a broader spectrum that simply sci-fi poetry and gave this definition: "Whether poetry or prose, speculative writing always creates a new world" (p. 75). It's an interesting collection they've assembled. I certainly write a lot of speculative poetry, what with my love of sci-fi, my love of apocalypse, my love of alternative futures and past. I'm honored to be included, especially once I read that the journal received 10,000 possibilities and chose 35 of them. you: the deeds, the degrees, the diplomas. Leave, too, your dollars and coins. Sew seeds into your hemlines. Seeds will be the new gemstones. Take all your needles and strong thread. Fill your small shampoo bottle with champagne. You’ll need it for disinfectant. the crystal in the candlelight. boots to your feet to set forth. Do It Myself or Let Others Do the Art? Yesterday was the kind of day that felt sent to me to help me test my resolve to be flexible and adaptable. I thought the day would go one way, but it didn't. I adjusted to the new way, and boom, another change or two. But happily, I was able to just shift gears and keep going. It helped that all the activities were pleasant. It actually began on Friday night, when I made an Advent wreath. We had planned to make a wreath for a Sunday service, but not to make ones for our homes. But someone suggested it, and I went through my usual thoughts: I don't need one; I can't do this; I didn't plan on this. But I did it, and it was fun! For more on that process, see this post. On Saturday, I thought, well, if I'm going to do more decorating for Christmas, I should do it today. I experimented with lights, which looked horrible bunched on the mantel but good draped over the china cabinet and sideboard. I put some of my grandmother's handmade ornaments on the mantel. Last night was my spouse's concert with the Broward Chorale, which involved a rehearsal and carpooling and uncertainty about the afternoon. But it worked out. While he was at the afternoon rehearsal, I went to an artist friend's Open House. I drank some wine, enjoyed some cheese and fruit, and looked at her jewelry and scarves for sale. She's been experimenting with fiber and making the kind of scarves that I made a year ago (see this post). While I didn't particularly like wearing my creation, she's come up with some stunning work. Part of it has to do with the more interesting variety of fibers that she has. So, I bought one, along with an interesting necklace in a lariat style, which is unlike anything I have. I liked supporting a fellow artist and a work colleague who has found herself moved from full-time to part-time through no fault of her own. And I like her work. My husband said of the scarf, "You could have made that." Yes, I could have, if I had spent as much on individual yarns as I spent on the scarf. I'm a valuable customer, in that I know how much those interesting yarns cost. Others are valuable customers because they have no hesitance in forking over money for a scarf. But in a store, I'm likely to say, "Fabric doesn't cost this much. Forget it. I'm not paying for this." It was a lovely afternoon. She had the Open House on her deck, in her tropical back yard, with our wonderful South Florida winter weather--just cool enough to sit outside without breaking into a sweat. And then it was off to pick up my spouse, grab a quick dinner, and go out for a concert. I know I'm biased, but the Broward Chorale was fabulous. They sang complicated music, along with festive favorites. For more on the concert, see this post. As we drove home, we talked about how remarkable it is that anyone could show up, and as long as they agreed to attend all the rehearsals, they'd be included. And the director took that variety of talent and turned it into a cohesive whole. We talked about other art, and how few of the arts welcome everyone, the way that singing does. I can try out for a play, but I don't get to act on the stage just because I want to do it, even on the amateur level. I can write or paint to my heart's content, but showing my work in a gallery or a literary journal isn't up to my just showing up. My jewelry artist friend often goes to shows, but she still has to submit to juries. Even the unjuried shows require an entry fee. But the Broward Chorale simply requires showing up with a desire week after week. And the singers improved into something that sounded polished and professional. I suspect the same would be true of any art form we attempted. The key to success is not the talent we already possess. The key to success is the showing up on a regular basis to do the work.